Book designer Justine Anweiler on how the cover for A Manual for Cleaning Women by Lucia Berlin came about. 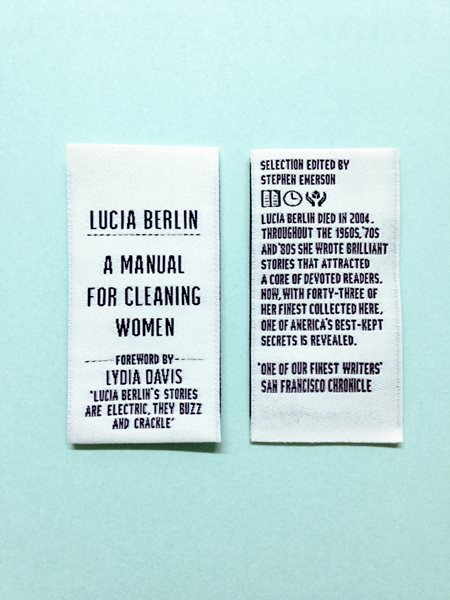 A Manual for Cleaning Women by Lucia Berlin was briefed to be conversational and nostalgic. Summed up beautifully by the editor, Kate Harvey, Lucia’s selected stories are 'like dispatches from an underworld of launderettes and lovers and too much alcohol, but told with such warmth and lightness.' With this as the steer, I got brainstorming over Christmas and by the time we were back at work I was convinced I wanted to do a clothing label. Having seen the American cover [on the left] and feeling incredibly daunted by the task of creating something as show-stopping as theirs, I got down to designing the physical label to be properly produced. Although I wasn’t sure how a clothing tag would work on a cover – the finished thing could look like what it is and fall completely flat – I thought the concept was strong and I was excited to do something a bit different in the day-to-day of a designer. My favourite part of being a cover designer is collaborating with talented individuals who don’t work on books covers regularly or ever at all. Once the concept and preliminary design was signed off and approved at the cover meeting I picked up the phone and started conversations with bespoke label makers in England. We decided to go ahead with proofing four different labels from two different companies – from there we found a clear winner. Although I loved the authentic woven sample from British Tags, we went with their printed sample for the cover because of legibility and visual cleanliness. That being said, we did go ahead with a bulk order of woven labels for promotional purposes because they are truly something to marvel. A genuine artifact of detail and craft that makes the everyday laundry instructions seem considered and human. In addition, I found and ordered up a professional housekeeping uniform and got ironing and stitch ripping. With the uniform prepped and the label in our hands, we commissioned Jonathan Simpson and started photographing. I had a vague idea of what I wanted for the spine, flaps, and back, but it wasn’t until the images came through from the photographer that the full jacket started to come together. I had always wanted the front to be a clothing tag in a vacant uniform that juxtaposed the warmth of a woman wearing it. When the photos of me wearing the uniform, straight on and buttoned up (the back) and side sleeve shots (the flaps) worked compositionally, I was absolutely elated. Although this cover was a labor of love in every way it was completely worth it. I’m very grateful to have worked with an editor who had complete faith and confidence in my idea and is a true fan of Lucia Berlin.